Looks like a rain spider to me (at least, that's what we call those ones in South Africa). Has it only got 7 legs? I would say it's definitely a huntsman from the forward swept legs like a crab spider to the flat, wide body. Not to mention the considerable size which is actually pretty small for a huntsman. And yes, it looks like this one lost a leg which isn't toom uncommon for a hunter-killer spider. It'll get the leg back next molt, though. The 8th leg is very hard to see, it's hidden behind the middle leg on the left side of the photo. Several people have told me this is a wolf-spider, is that the same thing as a huntsman? I don't know. Anyway, thanks so much for posting my photo! It's definitely not a wolf spider. 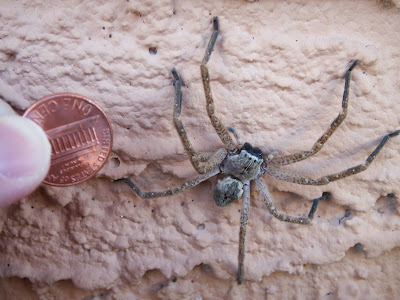 Wolf spiders are grey, hairy and large (like my grandfather), but they look different from this. They tend to have narrow "heads" (cephalothorax actually) and two eyes that are large, prominent and often set high. I don't care what you call it. I call it yucky!!! Hmm not sure. Possibly a Brown Recluse? But don't get bitten by those. Search "Brown Recluse bite" and you'll see what I mean.